The footbaths are filled with hot spring water from the Komono Onsen hot spring. 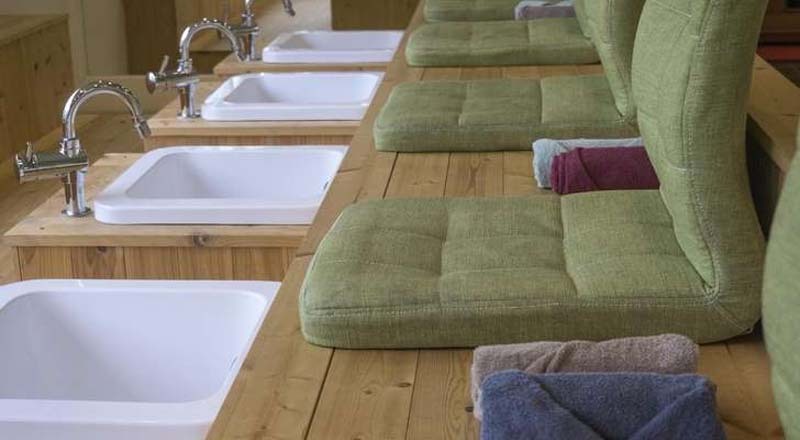 You may be familiar with nail salons and massage parlors in airports, but a foot bath train will probably surprise you. Japan's Kinetsu Railway Co. is offering a foot bath train for a limited time. Kinetsu Railway Co. has installed Japanese cypress wood foot baths in the second of the three cars on the Tsudoi tourist train. The foot baths are filled with hot spring water from Mie prefecture's Komono Onsen hot spring. This limited time experience began on October 6 and is available through February 24, 2019, on weekends and holidays only. There is a list of the days in which this experience is available on Kinetsu Railway Co.’s Facebook. Those who would like to experience the foot bath must pay an additional 100 yen fee (or 89 cents) on top of the regular fare of 500 yen ($4.46). This unique train experience was created by the Komono Association of Commerce and Industry to commemorate the 1,300th anniversary of the opening of Yonoyama Onsen.